Heya, how are you guys doing?? Nothing much happening over here on my end. I'm still looking for a job and am exploring lots of different options. As I've been reading the Mindful Eating book, my interest in working with people with weight issues (both under-eating and overeating) is growing. Our nation is obsessed with food, fitness, health, weight loss, clean eating, etc. and yet so many people are unhappy with their relationship with food and their body. I really want to help with that. Lately I've noticed a few mental shifts in my own heart and mind that I'm really excited about. I was working out the other day and a thin, pretty girl walked in. Per my default mode, I automatically started comparing our bodies. She was thinner than I am, and instead of feeling defeated or inferior, I started speaking truth to myself--her weight and my weight meant nothing about my worth, my value, or my personality. It just was what it was. And several times I've found myself starting down the restriction thought mode ("I'll just eat really clean for the next few weeks") just to remember that a healthy weight and relationship with food is about listening to my body and eating what it needs, not depriving it of what it wants or needs. These mental changes are huge and I'm excited to see what they will produce in the long-term. So with reading and soaking in the book, I have tried out a few of the exercises. I'm not gonna lie, it's hard for me to do. Sitting at the table without the tv on or my computer in front of me is a real stretch. I've been focusing on really looking at my food and savoring the textures and flavors of foods when I put them in my mouth. The other day I put a small strawberry chunk in my mouth and moved it around in my mouth. Have you ever noticed the texture of those tiny seeds on your tongue?? Yeah, me neither. Well, not until a few days ago. Or how about the wonderful crunch of granola in your yogurt? Having a crunch to add some texture to your food is a really great thing. For the most part I'm totally all about soft textures. In high school I would pour the milk on my cereal and then leave to finish up my hair so that my cereal would be soggy when I ate it. And the pureed week of nutrition food lab was one of my favorites. I know, it's weird, but it's how I do. Despite loving cold, wet things, I still like a nice crunch to go with it. Hence why I put cheetos, fritos, or doritos (really anything ending in -os) on my sandwiches. Don't hate. 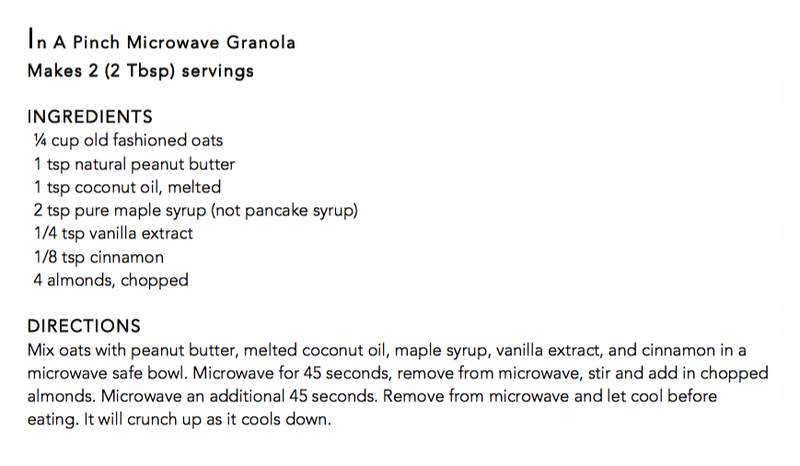 This recipe takes no time at all and could be eaten entirely for breakfast with some milk and fruit, or eaten in increments. I'm gonna leave that up to you. And you could add dried cranberries, toasted coconut, or other nuts if that sounds good to you. You do you.